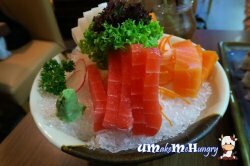 Dishes were getting more interesting in this case with 3 kinds of Sashimi, mock tuna, salmon and sword fish. The presentation and food art was stunning, how did they make the "veins" on the fish look so real? 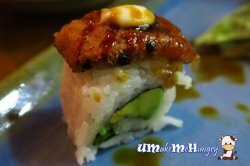 Arrangement of food with wasabi on the bed of ice made no different as what we have someone where! the radish salad was a great start. 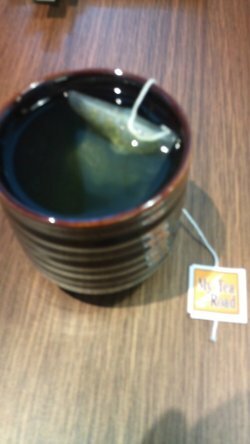 it was refreshing & good for 7pax. 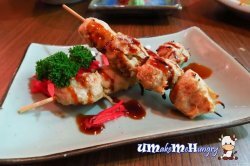 the goma (sesame) sauce was light & quite perfect. radish was crunchy. 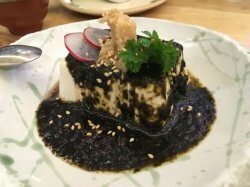 didn’t think much of the black sesame yu tofu. 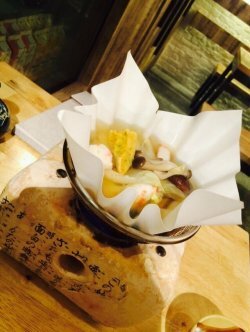 king mushrooms was one of the recommended dish. it was pretty good. 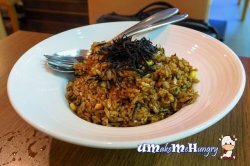 nice mushroom taste, good texture & great condiments. 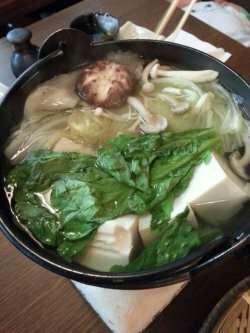 niece ordered a nabe dish. there were like 5 or maybe 6 dumplings. pretty ok too. soup was plain, good taste. wife ordered a tomato spring roll. i like this wonderful dish, crispy skin, very tasty spring roll, simply excellent! niece ordered a mushroom tempura. 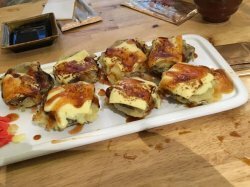 it was very good too, not like the usual tempura at all, more like a korokke (croquette). it was nice…i loved the cheese! it was a very enjoyable get together. dinner was S$110 for 7pax. 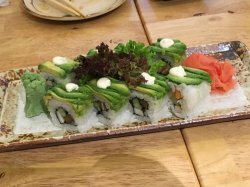 I tried some other Japanese vegetarian restaurants and it seems that many of them are just serving noodles and vegetarian sushi. 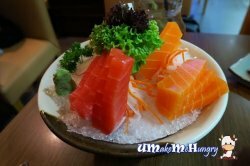 Sometimes vegetarian sashimi are just too artificial.Here in Teng they have more variety like paper hot pot, soba, tempura and desserts. 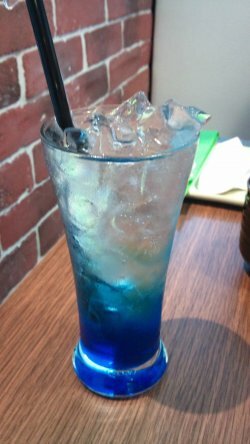 They tried to make the taste as close as it is to the real ones and this effort is highly appreciated.The decoration is decent as a Japanese restaurant. It's a place to come again. 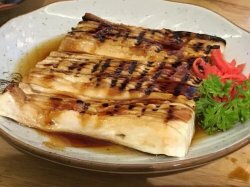 I tried some other Japanese vegetarian restaurants and it seems that many of them are just serving noodles and vegetarian sushi. Sometimes vegetarian sashimi are just too artificial. 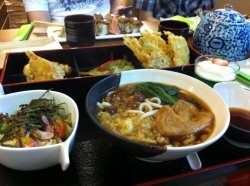 Here in Teng they have more variety like paper hot pot, soba, tempura and desserts. They tried to make the taste as close as it is to the real ones and this effort is highly appreciated. The decoration is decent as a Japanese restaurant. It's a place to come again. 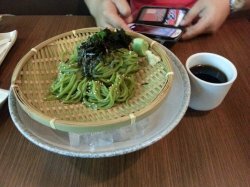 For vegetarian food, most people can only recall the curry vegetables and mock meat on fried bee hoon, commonly found in most chinese temples. 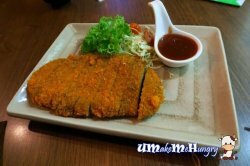 But vegetarian food in Singapore is more than just that. One such example can be found in Bespoke, also known as Teng. 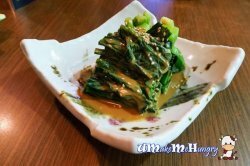 It is a vegetarian restaurant that offers reasonable priced Japanese cuisine. Located in a rather old building, the restaurant is actually modern looking with its stylish decoration. As one of us is a vegetarian, we decide to have our meal here. The soba is served in a basket with ice cubes below it to keep it cold. 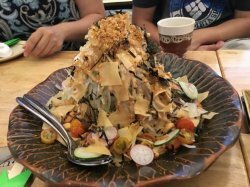 The soba tastes light and refreshing. 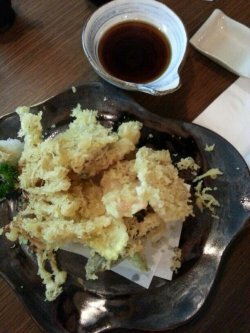 The vegetables tempura is nicely done and tastes light and crispy. 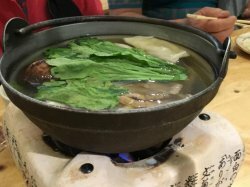 The hotpot is very filling with lots of vegetables such tang oh, cabbage, and mushrooms. The soup is also quite flavourful. Overall the food here is very nice for a vegetarian restaurant. 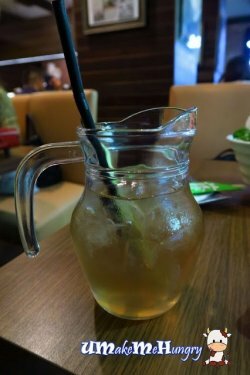 There is no GST, but there is a 10% service charge. Having vegetarian every 1st and 15th lunar calendar never gives me any problem these days as there are more and more shops selling vegetarian food. All on a tray, just like that they show many ways that vegetables can be cooked and combine into one set meal. Beautiful and tasty. 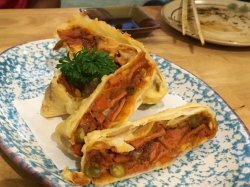 Over the last weekend on Saturday, I brought my daughter to Bespoke Vegetarian Dining for dinner. 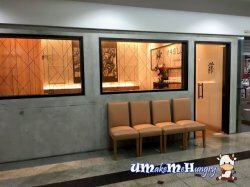 This Japanese style vegetarian bistro is located in Sunshine Place opposite Fortune Centre. 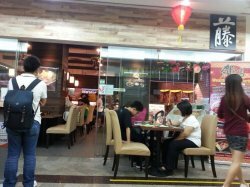 Although this is a newly opened bistro, it was fully packed with customers during the dinner time. After waiting for about 15mins, we managed to get a table for 2. 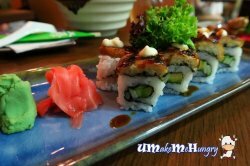 As usual we will order a few varieties of dishes to try. 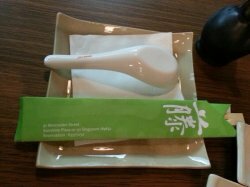 After flipping through the menu a couple of times, we finally settled down with the order of Buckwheat Noodles Soup, Teriyaki ''Chicken" and Shitake Mushrooms with Cheese.
. Usually tag will put the name of the tea, this Japanese tea bag has a quite an unusual name. Next came our Buckwheat noodle soup. The noodle has the QQ kind of textures with a clear soup that is rich in flavor. Floating on top of the soup is those fried tempura kinds of bits, which looks like an egg to me. Well, not to worries Vegan, Bespoke Vegetarian Dining do not serve egg, onion and garlic. However they do serve cheese, you just have to look out for this. Coming up is Shitake Mushroom with Cheese. This is one of the recommended dishes from the menu. Personally I do not fancy mushroom because of its strong smell. However the cheese in this dish covered up the smell of the mushroom so well, there were only mayonnaise and cheese taste lingering in the mouth. As the bistro was having some promotion going on, we only paid about $29++ after discount for the whole meal. Looking at the receipt, it actually cost about $40++ before discount. Well, I must say it was worth it. 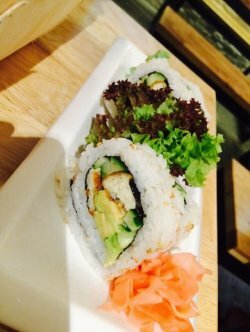 With the nice ambience of the bistro serving Japanese vegetarian cuisine, this is definitely a place for vegetarian to go to satisfy their craving for Japanese food.